An annual ride that takes place each June in Atchison, Kansas, and offers 35, 62, and 100-mile routes through the rolling farmland of northeast Kansas. An annual ride in McPherson, KS, part of a Spring Bicycle Festival which includes the ride, fun for kids, a picnic lunch, and drawings for bikes. Bike for the Brain is a Mission, KS ride that promotes increased understanding about brain-based illnesses. There are 3, 10, 33, 55, and 72 mile options. A one-day bicycle ride in Ellsworth County, Kansas. Riders are challenged to ride further then they normally would ride, up to 100 miles. Bike MS is a bicycling fundraiser for the National Multiple Sclerosis Society. Begins and ends in Augusta. Bike MS is a two-day bicycling fundraiser for the National Multiple Sclerosis Society. The 150 mile, two-day ride begins in Olathe or Topeka, overnights in Lawrence, and ends in Olathe. A cycling event that takes place at beautiful and challenging Wyandotte County Lake in western Kansas City, Kansas to help raise funds to help fight maternal and neonatal tetanus. A fundraising bicycle ride to benefit the United Methodist Open Door, a Wichita agency offering food/clothing/shelter for those in need. 20-mile, 50K, and 100K routes. A supported bicycle ride that takes place in Spring Hill, Kansas. 50 miles. The Bruce Whaley Spirit Ride is hosted and organized by the Kaw Valley Bicycle Club as a fund-raising event for the Leukemia Society. Ride 6.5, 25, or 50 miles through southeast Shawnee County. The annual Buffalo Bill Century is a fully-supported ride over scenic rolling country roads that span the length and breadth of beautiful Leavenworth County, Kansas. The Bull Creek Bike Bash is an annual family pleasure bike ride in Spring Hill, Kansas. Participants can enjoy the scenery of northern Miami County, and can choose between 20-, 30-, 50- or 60-mile rides. Tired of winter? Looking for an early spring ride? Then join like-minded riders for a day of bicycling in beautiful Pottawatomie County, Kansas. Santa Fe Trails Bicycle Shop presents the annual Cancer-Thon relay race at Abele's Field in Leavenworth, Kansas. The Capitol Classic is a showcase for the very best in Topeka area cycling, with 16, 38, 60, and 100 mile routes. An annual bicycle ride in Newton, Kansas. 3, 31, 43, and 53 mile options. Tour the beautiful countryside of Miami and Linn Counties, starting and ending at the Louisburg Cider Mill. 25, 57, 75, and 104-mile routes. A 200-mile, three-day bicycle tour through the Flint Hills of northeast Kansas, covering some of the best cycling terrain in the state, and using some of the same paths used by Native Americans, settlers, and cattle drives. An annual bike ride that takes place in Abilene, Kansas. 15, 30, 40 or 60-mile route options. Critical Mass Lawrence promotes the love of riding bicycles. On the last Friday of every month, cyclists meet to ride their streets to promote bicycle awareness. Critical Mass Manhattan is a group that aims to promote a healthy cycling community in Manhattan, Kansas. Critical Mass Overland Park takes place on the last Friday of each month in Overland Park, Kansas, to have fun while helping to promote awareness of cyclists on the streets. Critical Mass Topeka is a group of cyclists that flock to the streets once a month to promote cycling rights on the road. Critical Mass Wichita hosts a community bike ride on the last Friday of each month in Wichita, Kansas. Enjoy sharing the road in the safety of a group of fellow cyclists, and advocate for bike lanes and other bicycle infrastructure. Cycle CASA is an annual event that features a great day of bicycling in the scenic Flint Hills to support the Sunflower CASA Project. 12, 30, and 67-mile routes. Tour the scenic countryside of Dickinson County, Kansas at this family-friendly event. 10, 25, and 50-mile route options. Enjoy up to 45 miles of riding as part of the annual Dodge City Days celebration, and stay for the parade, rodeo, and barbecue contest! An annual bicycle ride that starts and ends in Lindsborg, Kansas, with 32 miles on a loop through the town of Falun on paved roads. An annual ride that takes place on the Flint Hills Nature Trail, starting in Osawatomie, Kansas. 24 and 44-mile distance options. Bicycle 100, 60, or 32 miles through southeast Kansas on a mostly flat course with a few small hills, through numerous small towns in Crawford and Cherokee counties. A Goddard, Kansas event offering 25, 50, and 75-mile routes through scenic south-central Kansas. The ride benefits the children of Heather's Camp for vision-impaired and blind youth. A bicycling event that begins and ends in Holcomb, Kansas, and travels through parts of Holcomb, Finney County and Garden City, with 10, 25, and 50-mile route options. This monthly ride takes place in Hutchinson, Kansas on the last Friday of the month at 6:30p.m. from the parking lot behind the Hutchinson Public Library at 10th and Main. A family bike event offering 10, 25, and 40-mile bike rides through southern Johnson County to benefit a variety of social justice agencies. A four-day bicycle tour on the back roads in Kansas, through the Smoky and Flint Hills. The Wichita Adaptive Cycling Omnium has been a staple of the U.S. Handcycling Series for many years, and includes three races, as well as a recreational ride. The Kansas City Ultra-Cycling Brevet Series provides opportunities for randonneurs to test their endurance with 200km, 300km, 400km, 600km, and 1000km events. A free community bike ride to promote cycling as a part of a healthy lifestyle in Lawrence, Kansas. One, three, and eight-mile options. An annual bike ride taking place in Leavenworth, Kansas, with 20, 36, 63, and 68 mile paved routes, as well as 20 and 50 mile gravel routes. Join hundreds of bicyclists for a spectacular ride on Lenexa streets at night with your friends and family. What better way to beat the heat than to come out to Lawrence, Kansas, and ride the Lizard Under the Skillet. There will be 30, 40 and 65 mile options available to ride. An annual ride organized by the Kansas City Metro Bicycle Club, beginning and ending in Gardner, and running past Clinton and Lone Star Lakes south of Lawrence. 28, 45, 64 or 100 mile options. An annual charity ride for the Mennonite Central Committee in Newton, Kansas, with rides of 35, 45 and 65 miles. 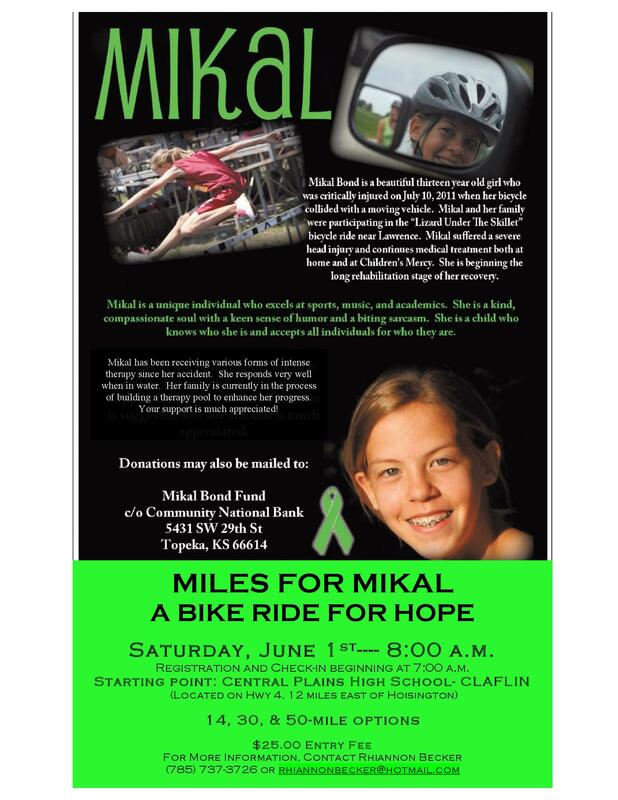 A benefit ride that takes place in Claflin, Kansas to help support a young girl critically injured in a bicycling accident. 14, 30, and 50-mile route options. An annual bicycle ride weekend that features both sagged and unsagged rides with 20, 40 and 62-mile options. McPherson, KS. Come to Lawrence, Kansas, and join the Lawrence Bicycle Club and hundreds of other cyclists for the traditional wind-up event of the year. 40, 80-mile options. An annual Butler County, Kansas ride to raise funds to send packages to troops in combat zones. 7, 20, and 50-mile route options. The Osage Prairie Bicycle Tour is a charity event to raise funds for local youth organizations in Parsons, Kansas. 15, 40, and 70 mile options. The annual Pasta 58 Bike Ride begins in Junction City, travels to Abilene, and back. Sponsored by the Junction City Recreation Department. An annual bicycle event that takes place in Marquette, Kansas with 10, 33, and 46 mile route options. Pedal SEK is a cycling event series that features 12 rides in 12 months in 12 counties in Southeast Kansas. A family ride and 50k or 100k leisure bike ride through the scenic countryside around Wichita, Kansas to benefit the children of Heartspring, which helps children with disabilities achieve their full potential. A memorial bicycle ride in honor of McPherson College sophomore Paul Ziegler, killed in a collision in 2012. Join cyclists worldwide to honor those who have been injured or killed while cycling on public roadways. The Edgerton Ride of Silence begins and ends at Edgerton Elementary School. Join cyclists worldwide to honor those who have been injured or killed while cycling on public roadways. The Lawrence Ride of Silence begins and ends at South Park. Join cyclists worldwide to honor those who have been injured or killed while cycling on public roadways. The Topeka Ride of Silence begins and ends at Washburn University . Join cyclists worldwide to honor those who have been injured or killed while cycling on public roadways. The Wichita Ride of Silence begins and ends at Heartland Bicycle. An annual ride that takes place as part of the Roots Festival, a celebration of live music and great food in Paola, Kansas. 10, 30, and 60-mile route options. 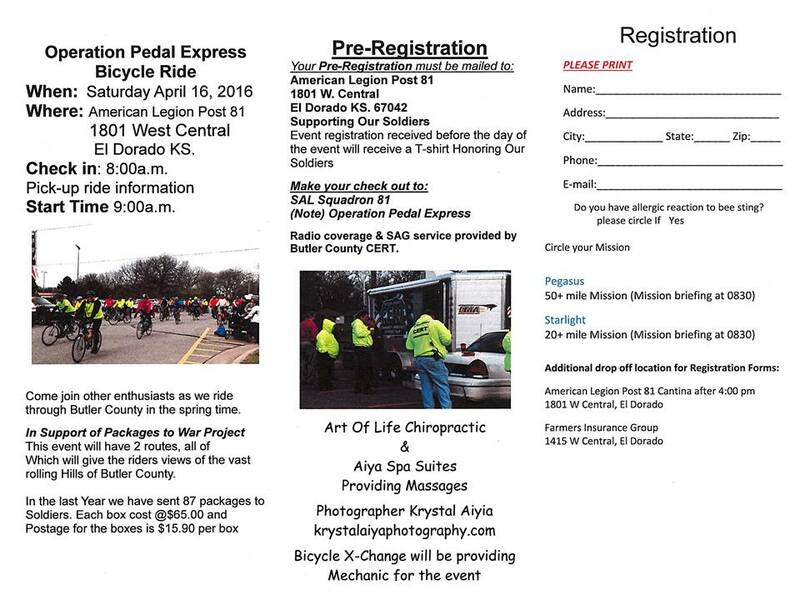 An annual El Dorado, Kansas event to help raise awareness for bicyclists on the roadways. 25, 50, and 80 mile route options. An annual event in Esbon, KS, featuring a 13.1 mile bike ride, as well as a walk/run event. The Sand Plum Bicycle Classic offers 13-mile, 28-mile, or 50-mile routes through Reno County, Kansas. This is not a race, but a fun ride for all to enjoy. SPIN! Neapolitan Pizza hosts weekly rides at its Kansas City area restaurants, 10-20 miles, 4 days a week, fun, free and guided by experienced riders. Celebrate Independence Day with a 20-mile bike ride in Sterling, Kansas. The Sunflower Suffrage Ride takes place in homage of Susan B. Anthony. The South East Kansas edition of the Sunflower Suffrage Ride offer a 15-mile route in Pittsburg, Kansas. Ride with us in Johnson County, KS in support of Sunflowers to Roses, a nonprofit organization dedicated to fighting cancer and promoting our core values of family, fitness and fun. An annual bike ride taking place in Hutchinson, Kansas. 25 and 50 mile routes. Kansas City's tastiest event on two wheels takes you on a tour of some of Kansas City's finest barbeque restaurants, and raises money for the fight against cancer. A one-day fundraising cycling event to benefit the American Diabetes Association, starting and ending in Wichita, Kansas. A cycling event that takes place across historic and picturesque Wyandotte County, Kansas, with 7, 22 and 40-mile route options. An annual ride that takes place in the Kansas City metro area in support of three local charities. 15, 40, 62, and 69-mile route options. Tour de Shawnee is an annual bike tour around the bicycle-friendly city of Shawnee, Kansas. An annual bicycle wine tour of wineries in Miami County, Kansas, with free wine tastings, and a commemorative shirt and wine glass for pre-registered riders. 13, 17, and 30-mile gravel route options. An annual charity bicycle ride in Hays, Kansas that benefits the Hays Area Children's Center. 5-100 mile route options on this tour of scenic and historical sites in Ellis County. An annual bicycle racing event near Lawrence, Kansas. It is a time-based stage race consisting of three stages. This fundraising ride for Prairie Travelers takes place in Winfield, Kansas and offers 35 and 65 mile options. An annual cycling event that takes place in Waverly, Kansas. The Wicked Wind 100, in early May, welcomes riders of all abilities for rides southwest of Wichita. Looking for an early fall ride? Then please join us for a day of bicycling in beautiful Pottawatomie County, Kansas. 16-50 mile routes available.